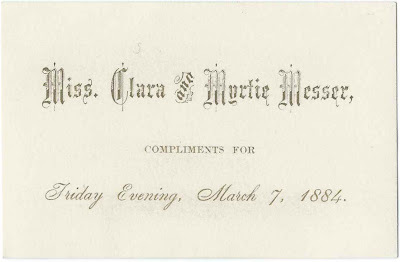 Calling card of "Miss Clara and Myrtie Messer, Compliments for Friday Evening, March 7, 1884. They may have been Clara Messer and her sister Myrtie Messer, the daughters of William Alonzo Messer and Mary Hannah (Nichols) Messer of New London, New Hampshire. 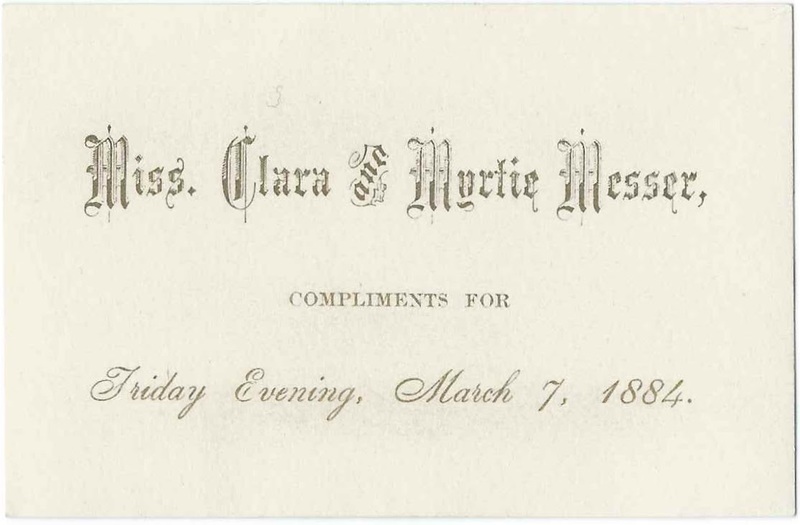 According to her Find a Grave memorial, Clara Belle Messer was born June 10, 1866 at New London, New Hampshire, and would marry George Thurston. Clara is buried in the Elkins Cemetery at Elkins, New Hampshire. According to her Find a Gravel memorial, Myrtie Kate Messer was born October 22, 1869 at New London, Connecticut, and would marry Harry Leroy Cochran. I believe they had at least two children. Myrtie is buried in the Blossom Hill Cemetery at Concord, New Hampshire. If you have corrections and/or additions to the information above, or if you feel that Clara Messer and Myrtie Messer are not the sisters of New London, New Hampshire, please leave a comment or contact me directly.